urora, Vera and Skuli live in a “hotel” at the bottom of Elise Dalley’s yard in Melbourne. Despite the indefinite nature of their one-year lease, Dalley and her non-feathered housemates care for the three chickens in a bounteous edible garden of their own creation. In Sydney, landscape architect David Whitworth has turned the small backyard of his Chippendale terrace into a well-coiffured miniature jungle. He rents with three others, and the garden is the heart of the home. Rick Gove mightn’t own his North Bondi rooftop terrace, but that didn’t stop him from investing in the help of top landscape designers to make it something special. All three households prove that, if the landlord’s on board, there’s no reason renters and house-sharers can’t nurture their own little piece of paradise. Whitworth, in Chippendale, doesn’t have the same luxury of space (his garden is less than two metres wide), but he does have the expertise to utilise a small urban area – and the passion to see it through. “When we moved in seven years ago there was just a clothesline area – nothing in it except slimy brick paving with a couple of years’ worth of leaves piled on top, completely unusable,” says Whitworth. In all cases, the landlord or body corporate are not only on board, they are enthusiastic. Like Whitworth and Dalley, Gove is 100 per cent responsible for the plants. “Rick uses his watering and so on as his zen time in the garden,” explains Ockenden. A thrice-weekly watering is enough for the hardy plant species they chose, and water-friendly self-watering pot plants such as Glowpear and GreenSmart can help when your landlord won’t pay for sprinklers. “Anything encouraging people to get more plants in their space is a bonus as far as I am concerned,” says Ockenden. Whitworth likes Mr Kitly self-watering pots for their clean design. For those who have no green thumbs and can’t afford to get the pros in, don’t worry: there’s an app for that! 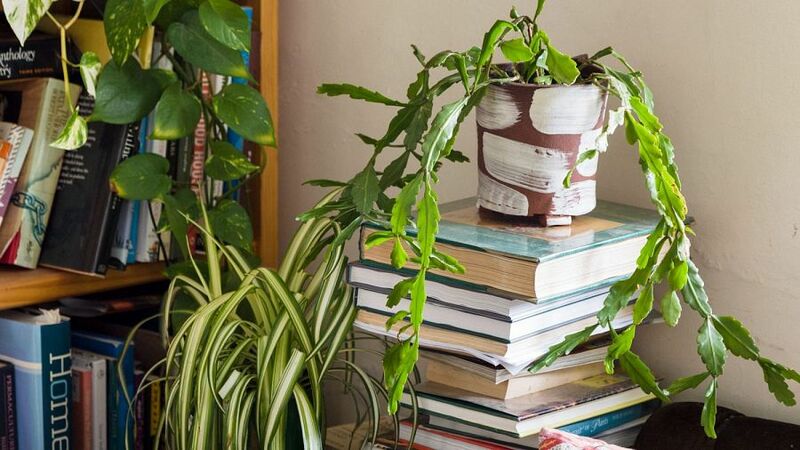 The Plant Life Balance app, part of a wider campaign to promote the proven health benefits of living with plants, lets you visualise your future garden using augmented reality to drag and drop plants over a photo of your space. Its seven inspirational looks in collaboration with The Planthunter includes “Sharehouse Heroes”, which features “tough-as-nails” pot plants that could withstand the wildest of parties. As well as an extensive plant list (see it here), each “look” comes with a raft of helpful hints for those unintentional plant-killers out there. Moveable pots feature heavily of course, as it’s easy to get attached to your green babies.